The Chandigarh audience is held together by the promise of value at the 1.25 lakh sq. ft Fun Republic. Strategically located along the highway that connects two state capitals. Chandigarh and Shimla, the expanse of this experience is spread over a leasable area of 90,000 sq. ft, across levels. Fun Cinemas offers one of the hippest and most happening experience of cinema in Chandigarh. After a successful launch of Fun Republics at Ahmadabad and Mumbai, Chandigarh is the third in chain of the nationwide integrated entertainment destinations being set up by E-City. Besides the multiplex, there is a world-class food court-Fun Food Court-featuring eminent brands like Sagar Ratna, Pizza Hut, Tikka Express, Cafe Coffee day, and Ruby Tuesday. It also houses the city’s first McDonald’s outlet, a favourite among the tourists. A dedicated chunk of space at Fun Cinemas in Chandigarh caters to the shopping needs of the guests. This Fun Mart features brands like Levi’s, Dockers, Reebok, Adidas, Provouge, Lee Cooper, Samsonite, Gini & Jony, Lilliput, Rockport, Greg Norman, Hangten, Ethos, Eminent, Numero Uno, Oleega, Nzyme, and Fen Fang among others. The adjoining Planet M is a meeting point of music lovers in the city and also features a virtual reality futuristic video games zone branded as Fun Gaming. With the colorful and lively ambiance Fun Republic Chandigarh is fast becoming a popular destination for youngsters in the city. Music lovers and video game enthusiasts will also find many interesting things to catch their fancy here. 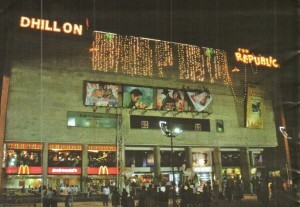 You can view the list of complete Stores and Shops in Fun Republic, Chandigarh here. It is a good review about fun republic.